Endemic to the Hawaiian Islands, Eragrostis variabilis, is now one of the most common native plants on Midway Atoll NWR after declining in numbers. 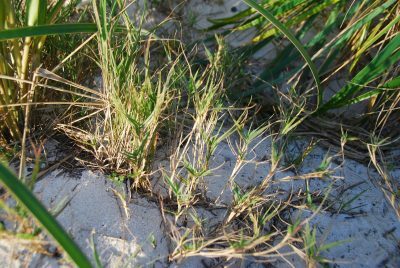 Heavily propagated and outplanted using seeds from Laysan Island, this bunchgrass is a “warrior species” in habitat restoration; it is used for erosion control and dune stabilization. This species also provides important nesting cover for Laysan Ducks, Bonin Petrels, Wedge-tailed Shearwaters, and Red-tailed Tropicbirds. Adapted to well-drained, sandy soils, E. variabilis provides albatross chicks a modicum of shade to prevent overheating. Its dense root system helps reduce burrow collapse under human traffic. Shadehouses on Eastern and Sand Islands are regularly stocked with E. variabilis seedlings for outplantings by USFWS staff, volunteers, and contractors. 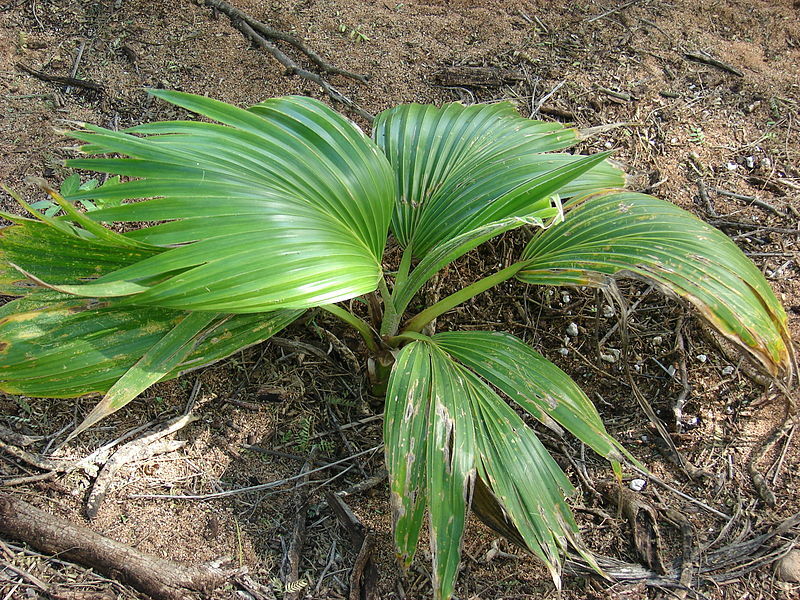 Beach naupaka is an important coastal plant at Midway and throughout the NWHI and Main Hawaiian Islands (MHI). In 1891, naturalist George Munro described Eastern Island as “the most green” of any island during their surveys of the NWHI due to extensive S. taccada cover. Naupaka’s fleshy white fruits can float for months in the ocean and still germinate after being in salt water for up to a year. The plants’ flowers are small and whitish with light purple streaks, with petals only on the lower half. (One explanation for this unique structure comes from the Legend of Naupaka in which two lovers are separated from one another. The mountain naupaka’s occur only on the flower’s upper half.) While naupaka provides useful habitat for some birds, it can dominate to the exclusion of most other plants. At Midway, dense stands of this shrub and dune stabilizer can block seabird access to the beach. Even native plants require weeding on Midway! Also endemic to the NWHI and MHI, this species is dispersed across the full range of dryland habitats, from coastal to subalpine. 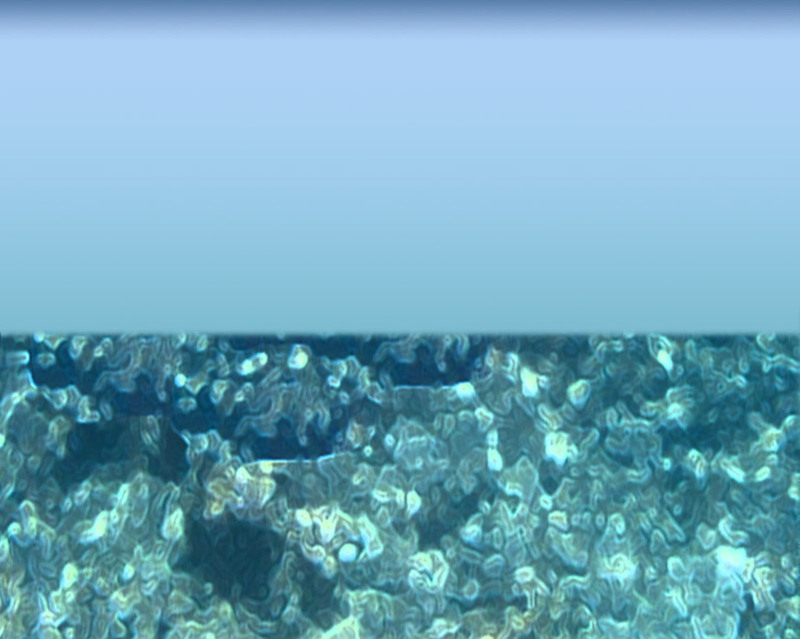 Brought to Midway from Laysan Island in 2005, C. oahuense is used in ecosystem restoration to help with erosion control. Sooty Terns and Red-footed Boobies use this plant as nesting material on other islands. Compared to other native species, it is relatively easy to propagate from clipplings. 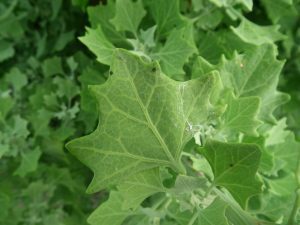 Once planted and thriving, this species grows quickly and produces seed throughout the year, thereby readily encouraging growth of more seedlings. A perennial, herbaceous plant, S. portulacastrum spreads and forms large patches and features thick, smooth, reddish stems with small, glossy, green, succulent leaves. 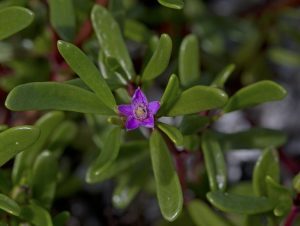 Often found as groundcover in open, coastal areas, S. portulacastrum is one of the most salt-tolerant of all coastal plants. It’s a pioneer species, growing on sunny, windy, sandy beaches, and coastal coralline areas; it even tolerates occasional sea water flooding. As an important dune stabilizer, S. portulacastrum is used for ecosystem restoration along wetlands and other moist habitats across the atoll. 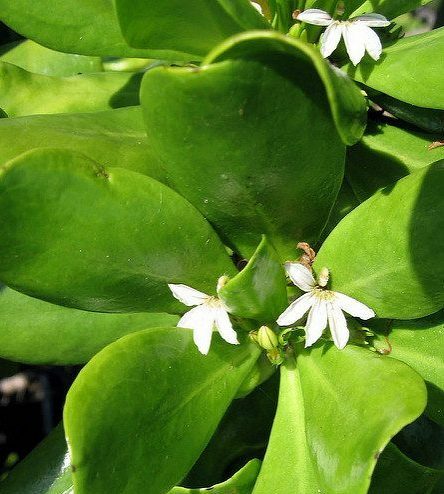 Its soft, succulent stems and leaves are used as loafing habitat by a variety of seabirds and terrestrial birds. Some of Midway’s native plants have beautiful, showy flowers. 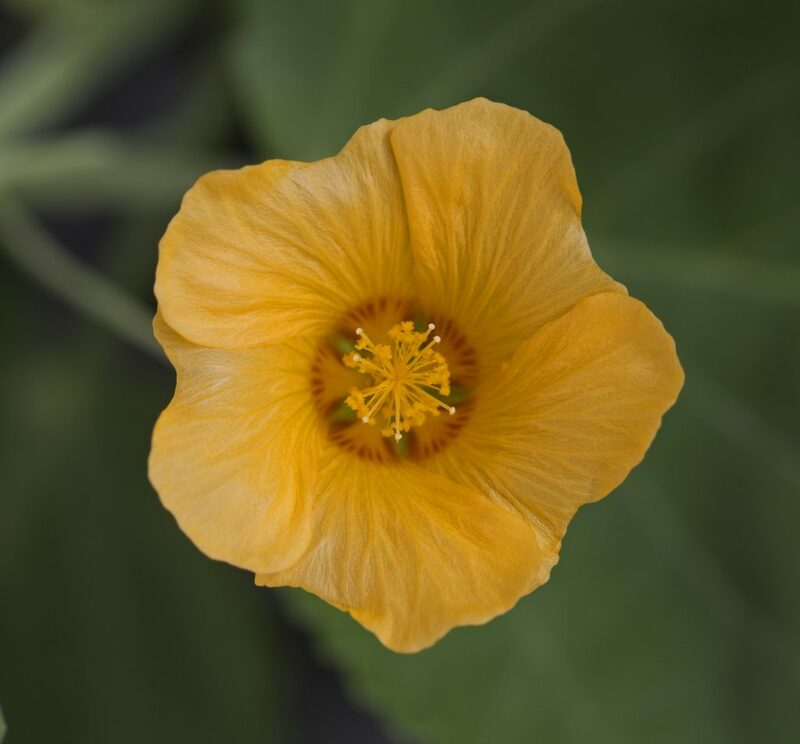 ‘Ilima (Sida fallax), which means “yellow” in Hawaiian, is a low-growing herbaceous shrub or ground cover with small bright golden flowers. Common on the main Hawaiian Islands, ‘ilima is rare on Midway. Koali ‘awa (Ipomea indica) is a sprawling vine found along the beach, wetlands, and in the nearshore areas, with flowers that range from indigo to light blue. Two distinct forms of I. indica occur on Midway: one resembles the native form found throughout the NWHI with lighter-colored, bluish flowers; the other is more like an ornamental form with dark purple flowers. Another native vine, Ipomoea pes-caprae, known as Beach Morning Glory or Pōhuehue, occurs on Midway with pink to rose purple flowers. Loulu / Nīhoa Fan Palm (Pritchardia remota) is an endangered palm species endemic to Hawaii and the NWHI. Only one known “wild” population of approximately 680 individuals exists on Nihoa Island. Midway Atoll, Necker Island, Laysan Island, and Kauaʻi are all potential sites where this species could be reestablished. Scientists are unsure if P. remota is native to Midway; however, establishing another population where it could be monitored would help provide insurance against extinction. 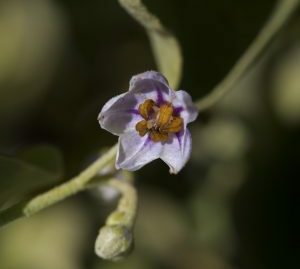 Pōpolo (Solanum nelsonii) is proposed for endangered species status; its last refuge may be Midway Atoll NWR. Extirpated on Kure, Laysan, Niʻihau, Kauaʻi, Oʻahu, Maui, and Hawaiʻi, this sprawling coastal shrub has been reintroduced at some of these locations. On Midway Atoll, Pōpolo is primarily found on Spit Island; one large plant exists on Eastern Island and four on Sand Island. Nearly 400 of these plants germinated on Spit Island after the 2011 tsunami, however, the invasive Finger Grass (Eustachys petraea) overwhelmed all but about 30 of them. Currently, Pōpolo is being propagated and outplanted by USFWS staff and volunteers; several hundred seedlings have successfully germinated. 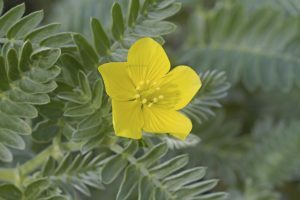 Another common native plant is Nohu (Tribulus cistoides), found in large numbers on Eastern Island, carpeting the old runways in a sea of yellow flowers. 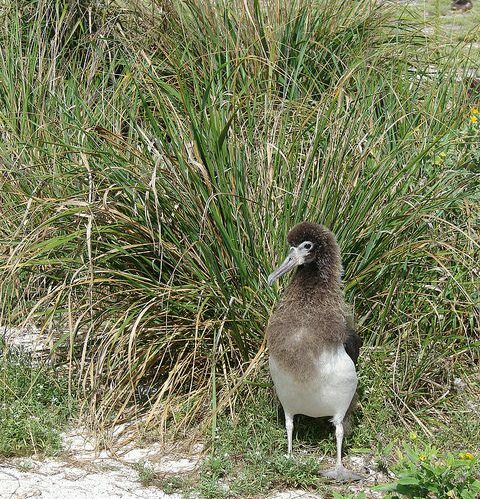 After an initial decline, the species rebounded after USFWS eradicated rats from the atoll. 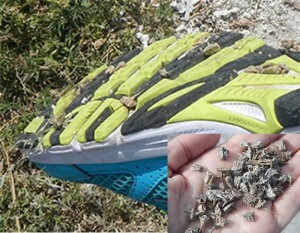 Its spiky seeds puncture bike tires, shoe bottoms and the webbing on birds’ feet. This low-growing ground cover produces large barbed seeds called caltrops, named after the iron spikes strewn on Roman battlefields to stop the advance of horses and chariots. The barbs become embedded in whatever steps on them. In Hawaiian, Nohu means “angry,” which likely refers more to human reaction than the plant itself. Albatross seem to tolerate the seeds when scattered on grass or sand and along with Red-footed Boobies may even use the plant for nesting material. Although T. cistoides helps stabilize the soil, USFWS is hesitant to outplant it on Sand Island. Nohu is typically considered a transitory or pioneer species, first occupying dry, arid environments and then giving way to other native species. Earlier attempts at re-introduction of these two plants have not been successful.